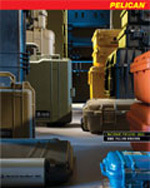 The new Pelican 0450 Mobile Tool Chest has two extra compartments for storage. Easy access beneath the top lid gives you an extra storage space of 20.6 x 10.64 x 3.00" (52.3 x 27.0 x 7.6 cm). The tool chest also includes three unsealed pockets on the left side to store smaller items. Interior Dimensions(L x W x D): 20.56" x 10.97" x 12.65"
Weight Without Drawers: 33 lbs. Weight With Drawers: 41.5 lbs.